Sexuality & Space (Princeton Architectural Press, 1992) contains the proceedings of an eponymous 1990 conference at Princeton University, and was both the first and last book-length publication dedicated to a comprehensive discourse on sexual identity, as addressed from within the discipline of architecture. 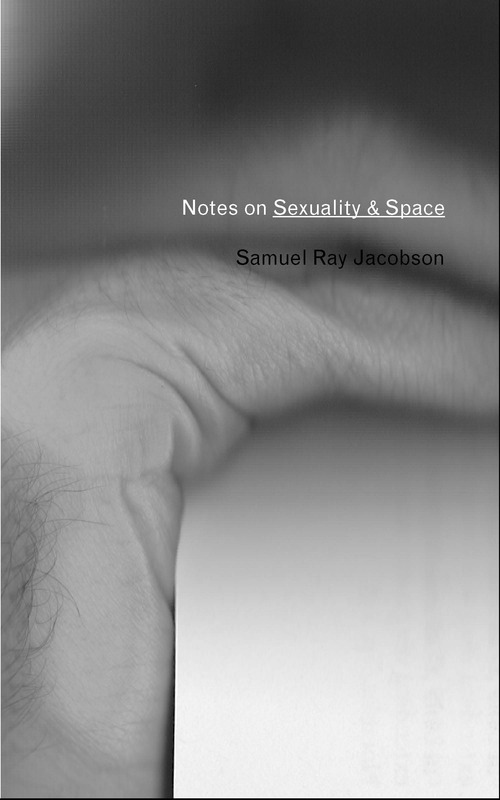 In this book, Jacobson argues that, to the extent that feminist theorists conspicuously ignored in architectural discourse and practice are addressed by Sexuality & Space, its interdisciplinary exchange — in which theories of sexuality are reread in architectural terms, and architecture is reread in sexual terms — has the effect of asserting the very silence that its inquiry ostensibly alleviated. This is a result of the volume’s particular and strategic historicization of its cultural condition. By carefully examining the constative impact of literary style within Sexuality & Space — that is, by looking at how the use of language, therein, impacts that document’s inscription of its historical context — the intent is to come to a better understanding of how that publication was both the beginning and end of the conversation it sought to inaugurate. In the broadest possible terms, it is the intention of Jacobson’s book to come to an understanding of how text happens in the context of architectural discourse. In the discipline of architecture, the written word is often viewed with suspicion; for people who create spaces it is difficult to trust what cannot be touched. For what is perhaps the first time, Notes on Sexuality & Space tries to understand how architecture’s theoretical spaces are constituted by its authors, and to interrogate the materiality of language therein: to understand how our texts configure their successors, to interrogate the particular cordoning off of disruptive intimacies within the field of architecture, to deconstruct their effects through taxonomy, and, most importantly, to assert the embodied agency that inevitably underlies the ontology of the author as an architect of text. The graphic design of the book carries on the theoretical narrative into aesthetic form, echoing the work’s three-part iterative structure with an integral graphic program that meshes the text commented upon, and the marginalia generative of this book-length study, into the book itself.